Most career sites cater to the low-hanging fruit: candidates who were going to apply already. They hope branded searches, job boards and ads are enough to draw in plenty of candidates and engage them, but we know they won’t. Content expands your reach to people who don’t know who you are, who aren’t already fans, and may not even be ready to apply. It engages at every stage of the funnel, compelling them to get closer to your most important action: application. 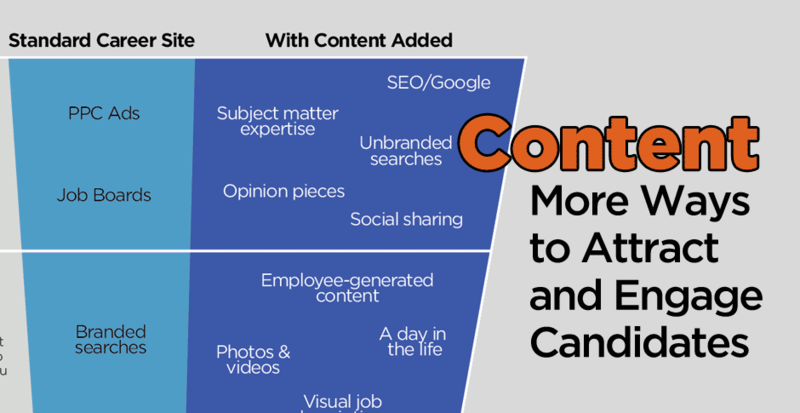 So if you’re ready to take your career site beyond the “usual tactics” without breaking the bank, start looking at how content can drive more and better applications than just an apply button. Give your most crucial and hardest-to-hire a reason why they should apply and you’ll be surprised at how many do.